Michael Bracken, “Wedding Day Disaster” in True Story (June 2017) as well as “Baseball Daddy” and “Summer Skeevy” in True Confessions (June 2017). 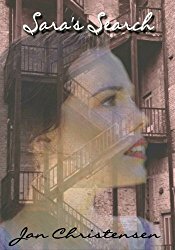 Diana Deverell, Open the Door: Nora Dockson Legal Thriller #5, Sorrel Press (June 2017). Patricia Dusenbury, “Family Man” at Mystery Tribune (June 8, 2017). Gail Farrelly, “Double Trouble: Mystery Short Story” was published in Kings River Life Magazine (June 17, 2017). John M Floyd has three stories out this month. “Witness Protection,” in Woman’s World (June 19, 2017) as well as “The Rare Book Case” in Woman’s World (July 3, 2017 issue) on sale now. He also has “Trail’s End,” in Alfred Hitchcock’s Mystery Magazine, July/August 2017. He also has a piece on short story writing, “Long Story Short” at FundsForWriters (June 16, 2017). David H. Hendrickson, Huram's Temple, Pentucket Publishing (June 2017). Martin Roy Hill, The Butcher's Bill (The Linus Schag, NCIS, Thrillers Book 2), 32-32 North (June 2017). 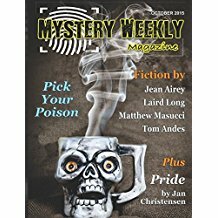 Steve Liskow, “Look What They've Done to My Song, Mom” in Alfred Hitchcock’s Mystery Magazine, July/August 2017. Robert Lopresti, When Women Didn’t Count: The Chronic Mismeasure and Marginalization of American Women in Federal Statistics, Praeger (June 2017). Sandra Murphy, From Hay to Eternity: Ten Devilish Tales of Crime and Deception, Untreed Reads (May 2017). O’Neil De Noux, “The Magnolia Murders” in Alfred Hitchcock’s Mystery Magazine, July/August 2017. Alan Orloff, “Happy Birthday” at Shotgun Honey (June 15, 2017). Jude Roy, La Valse du Bayou Serpent (The Bayou Serpent Waltz), Amazon Digital Services (June 2017). Jennifer Soosar, Parent Teacher Association, Black Opal Books (June 2017). When, and only when he makes the call onlist, email news for next month's post to SMFS President Kevin R. Tipple (KEVINRTIPPLE at VERIZON dot NET). So you want to be a writer. So did I. I've probably written my million words--about eighty short stories and ten full-length novels, and a couple dozen articles, some published, some not. It hurts to get that first rejection. It's discouraging to get the first dozen. Baby steps are needed. A baby learns to walk by practicing every day, and that's what a beginning writer should do. You learn an awful lot by simply doing. But it doesn't hurt to read a book a month about writing, some of the better writing magazines, and now blogs. Read best-selling authors' autobiographies or self-help books. Stephen King in On Writing said you should read an hour for every hour you write. You can learn a lot by reading the current best sellers and widely in the genre you're particularly interested in. The ONLY way you'll ever get published is to write. Thinking about it, talking about it won't get you there. You have to go to that quiet spot with your writing tools and just do it. If you ever took a journalism class, you know the basics of writing nonfiction for newspapers and magazines. However, these basic tools can also help you hone your fiction into tight, sharp writing that is both clear and complete. This is, of course, especially important for short story writers. The basics are: who, what, where, when, why, and how. Every journalism student has to memorize those words. Usually in that order. Sometimes one or more can be left out, but it should be a conscious decision with a good reason. Not long ago, for example, our local newspaper had an article about making the city greener, and explained about an organization giving away free trees in a few days. They did the who—the name of the organization. The what--a giveaway of three trees to anyone who showed up; the when--the date; the why--to make the city green. And the how--go and get the trees. They left out one vital fact, however. The where. No address, no clue about the location of the giveaway. So, both the reporter and the editor missed something really important. Oddly enough, they reported on the event after it was over (I believe this is yearly and they always give away the trees in the same location), told how many trees were given away, and—you guessed it, the location where it all took place. In this case, NOT better late than never. The reader of fiction almost always needs all these elements, too, for the story to make sense. Leave one vital part out, and you’ve lost her. A good rule of thumb is to be sure you have them all there when you are finished with all your edits. Because you may have put them all in when you wrote the piece (or you may not have), and you may take something out that was really needed, or miss that something was left out in the first place. But if you look one last time for each element, you should be fine. The steps below help me keep on track when writing a new story. Through trial and error, I've come up with these ideas to stay organized. 1. Get idea. Get excited about your idea. Start outlining, mental planning--whatever you do to get going. I always just dive into the writing. 2. Start writing the story. Open a second document on your computer. I name mine [NAME OF STORY] notes.DOCX. Keep it open whenever you're working on this manuscript. In it note each new character's name and description as you write about him or her, and any descriptions and names of specific places. If you’re in flow and would rather wait until the end of your writing session to put this info down, that's fine, but it will take you longer to find it again to copy and paste. In the next section of your notes, copy and paste or type in research you did and other items as they come up. To keep good track of your research and to make it easier to go back to it, include the links to the material if you found it on-line. 4. Submit. In your notes document, make a table to show where and when you submitted the story and the results of the submission. If you need to write a cover letter, first write it in the notes doc, edit it carefully, then copy and paste it into an email submission or into an on-line form if that’s the way submissions are handled by your target. 5. Instead of waiting to see if it’s accepted, get to work right away on a new story. It is the first Monday of June and Jan is back today with some simple advice that is often ignored these days…. I really want to know. All the time. In real life, and when reading. Nothing makes me more ticked off with a story than not knowing who’s speaking. And it’s rare anymore for me to read a book where I don’t find places where I have to reread to figure it out. Please, don’t do this to your readers. I notice it happens most often near the end of a story when things are winding down, answers to questions provided, and lots of characters are talking. Just when you really don’t want to stop to figure out who’s saying what. Did the writer get in a hurry and leave off the attributions? Did the author figure that her characters’ voices were so clear by now the reader would automatically know who was talking? (Doesn’t happen with me, and I’m sure I’m not alone in that.) Has the writer bought into the idea that writing “he said” or “she said” is breaking a rule? I’ve been reading and writing for a long time now. A decade or so ago a very popular author suggested that a simple “he said/she said” was the best way for the reader to know who was talking instead of using modifiers or such attributes as “he hissed,” or “he growled,” or said with an adverb, “she said softly,” or “he grumbled loudly.” This decade, someone else “ruled” that you should not only not use attributes at all, but instead use small actions to show what the character is doing and thinking while speaking. Thus, you may notice a heck of a lot of coffee being drunk now in what you read. Or tea. It’s so easy to use “Jenny took a sip of coffee” that many writers do use it. Over and over again. After Jenny takes a sip of hers, John answers and adds cream to his. How does this add one bit of information or interest to the story? It doesn’t. Instead, it’s often distracting. Very distracting if the author only uses this device. What to do? Mix it up, of course. 2. Have the occasional character hiss (be sure there’s some “s” sounds in the words he utters, however) or roar or whisper. 3. Use “he said” or “she said” when you want fast action along with the dialogue. Any reader older than ten is used this and won’t even notice. But they will miss it if they cannot figure out who is speaking. And they will be ticked. Trust me on this. One more bit of info about this. With e-readers, things can get even worse when the attributions are left out because of wonky formatting. Which is exactly what happened to me just before I wrote this rant--I mean-- advice. Near the end of a novel by an extremely famous and popular writer, she left out a “he said” where the formatting got messed up (big NY publisher, too) and two paragraphs ran together. Or I think they did. I had to go back to re-read it because at first I thought one person was speaking, but when I got about four or five paragraphs farther, I thought it might have been the other character. I’m still not sure I ever got it right because it went on for eight paragraphs without telling who was talking. There was a small action in there, but it didn’t help identify the character speaking. In fact, it made it harder to figure out. What do you suppose I’m going to remember the most about this novel? Earlier this week the Private Eye Writers of America announced their Shamus Award nominees for the 2017 Shamus Awards. There are five categories for awards given in regards to private eye novels and short stories first published in the United States in 2016. 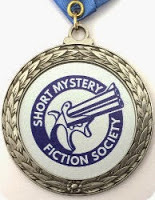 Three members of the Short Mystery Fiction Society are nominated in three of the five categories. In the category of “Best Private Eye Novel" the SMFS member nominee is Robert S. Levinson for The Stardom Affair. In the category of “Best Original Private Eye Paperback” the SMFS member nominee is O'Neil De Noux for Hold Me, Babe. 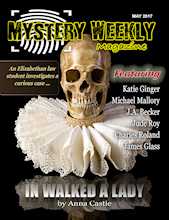 In the category of “Best Private Eye Short Story” the SMFS member nominee is Dave Zeltserman for "Archie On Loan" in the Sept/Oct 2016 issue of Ellery Queen Mystery Magazine.. The SMFS congratulates our member nominees as well as all the nominees. The full list of the 2017 Shamus award nominees can be found on the Private Eye Writers of America website. Labels: 2017 Shamus Award Nominees, Archie On Loan, Dave Zeltserman, EQMM, Hold Me Babe, O'Neil De Noux, Private Eye Writers of America, Robert S. Levinson, Sept/Oct 2016, short story, SMFS, The Stardom Affair. The membership of the SMFS is pleased to announce that, by acclimation, Jay Hartman has been elected the 2018 Derringer Coordinator. Jay’s term of office begins on July 1, 2017.